Publications: Newsletters -twice a year. Current projects:	 1. Catherine and lane Consols near Penrhyndeudraeth. Clearance of undergrowth and trees from mine structures. Some of the structures have been stabilised and fenced off. The Biglands' waterwheel pit has been cleared of silt and a stream diverted. This is an ongoing project with two working weekends a year. Contact the Secretary. 2. Mid-Wales. Small active group in carry out projects. 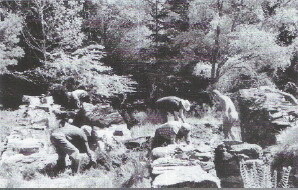 During 2005 the group cleared gorse away from the entrance of Taylor's Incline Plane at Goginan. 3. Heritage Weekends -August Bank Holiday. An initiative to forge links between the local community and the Trust. It includes guided walks and an evening event of talks and slide shows. Previous events have been held at Cwmystwyth mine. 4. Glyn Pits, Pontypool. Ongoing project to restore the engine houses in conjunction with the local council and various other organisations. The project has received funding from the Heritage Lottery Fund.